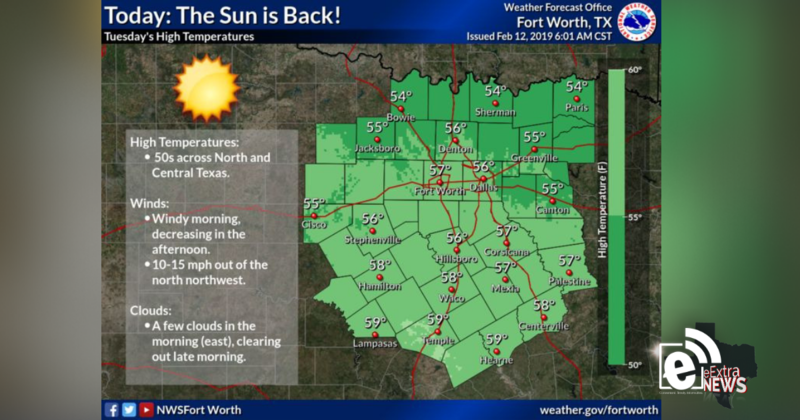 After those cloudy and wet days, expect plenty of sunshine and nice weather today. Afternoon high temperatures will stay in the 50s with north/northwest winds 10-15 mph. Here’s the rest of the week and weekend outlook. Elevated fire threat west of the I-35 corridor on Thursday, due to warm temperatures, low humidity, and breezy conditions. A strong cold front will arrive Friday, causing temperatures to be much cooler than Thursday. Highs will only reach the 50s and 60s. With limited moisture, no rain is expected to accompany the front.